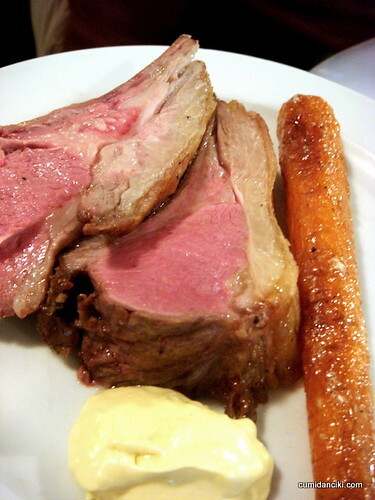 St John, "Nose to Tail Eating"
Arriving in London straight out of the humid tropics and smack into the thick of winter, we were constantly famished. Meeting up with some foodie friends of ours who were living in London, they promptly told us, “this time of year, London is all about the pig..” or duck, or pheasant, or even bone marrow excavated from deep hollow bones onto great rashers of toast, he might have added .. because in moments, we were about to hit the restaurant-rich meatpacking district of London. For St. John, we took the Circle line to Farringdon. We exited the station bearing left and crossed over Turnmill Street on to Cowcross Street which took us to the junction of St. John Street. 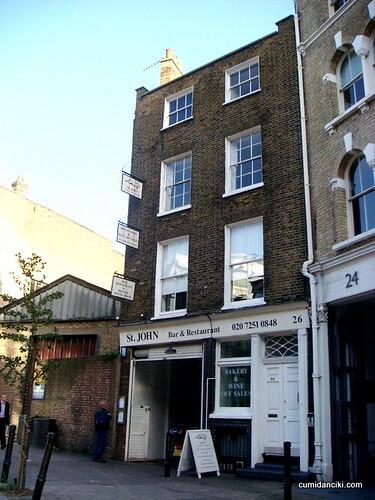 At the junction at Smithfield Market, we turned left and walk along St. John Street for around 50 yards or so and finally, we saw St. John on the opposite side of the street. Chef Fergus Henderson, extraordinary cook and rebel. This place looks like an old smoke house and is located adjacent to London’s most famous meat market, Smithfield. The whole surroundings make the restaurant seem rather incongruous. We heard fine things about this joint. Mainly that there is no palaver here, no pretension - what comes out of the kitchen is good for the stomach and the soul. If you are expecting dainty amuse bouches and cute little starters, then you have come to the wrong place. I remember studying in London at the peak of the mad-cow-disease saga that had everyone paranoid to the heavens, about what they ate. During that time in Britain, where eating red meat was stigmatized and offal almost taboo, St John was leading the way in against - against eating meat. It is interesting to note that Chef Henderson was trained as an Architect. Seriously, this place looks like the cafeteria in my old Halls of Residence. I am talking whitewashed walls, long rows of uncomfortable wooden tables and chairs and gray flooring. It's not about the surroundings. It's all about the food. We take one look at the menu and see heavy, robust, masculine English food. 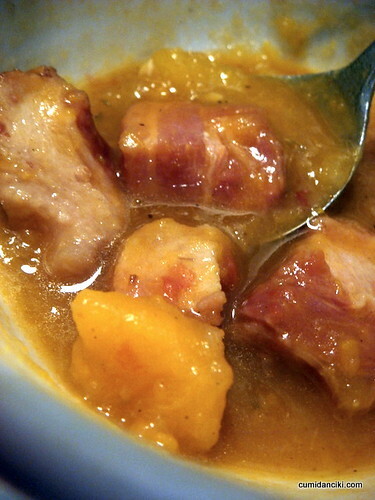 The bacon squash soup photo speaks for itself. If you have an Asian stomach, you will do a double-take at this so called 'starter' because I think there is half a pig in there, in the form of bacon chunks. The taste is awesome. Profoundly tasty is the term I like to use. Henderson's defining principle of nose-to-tail cooking has also found its recessionary time. "If you are going to kill an animal," he reasons, "it seems only polite to use the whole thing." I like this guy Henderson. Sounds like a practical man. Fine.. we now get the idea. 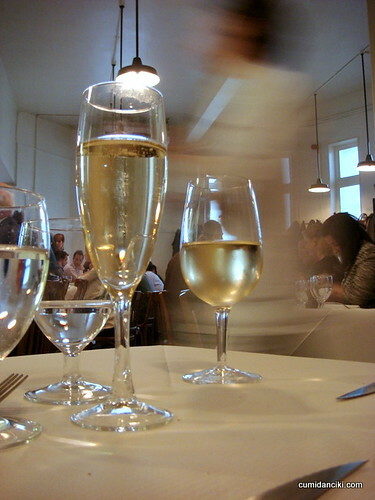 We start to anticipate a really fine meal. It becomes evident as we sit there, why this place is so cool. There is unconventional humor in eating such unmentionable cuts as heart, brains, marrow etc., all of which have helped make St John the fashionable institution it is. 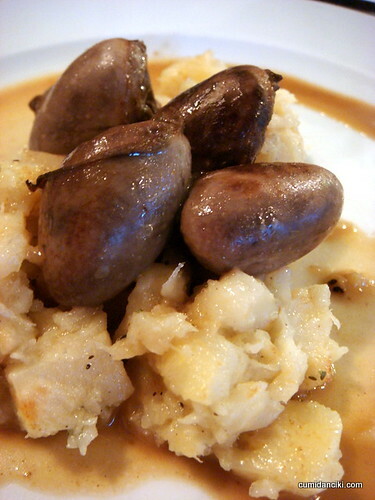 My duck ox heart with celeriac was quite interesting. 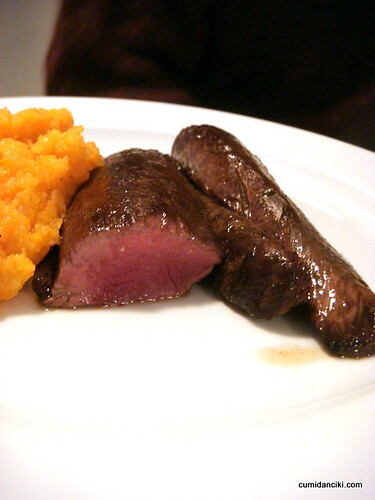 The characteristically muscular, rubbery meat of the heart was delightful. Since I am a big fan of offal, I had no complaints about this starter. This cold salad, was well, cold. I did not the mallard as it had not much of a flavour to it. 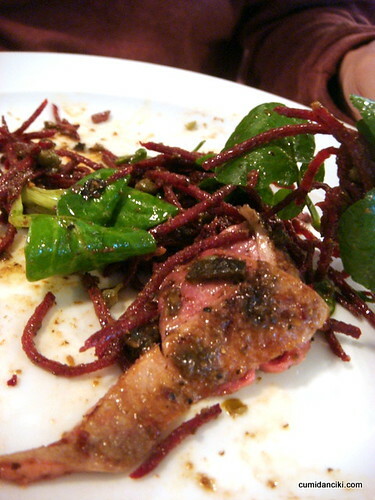 The beetroot was interesting as it was crunchy and had a rougher texture about it than regular beetroot. We also had the Roast Bone Marrow. This is permanently on the ever changing menu so if you go, you must try this signature dish. The marrow is superb. As you can guess, the bones that stand up form your plate like the hulking stonehenge are huge, thick and over-spilling with sweet, slick, oily marrow. This is served with a long lobster fork-like implement, necessary for the successful extraction of precious marrow. Then enter the Mutton special. I died and went to carnivore heaven. I had my reservations about the mutton being too gamy , but this was just superb. Soft, tender, moist. How do I find any more extravagant superlatives to describe this dish? Thought the Hake with croutons was massive, we polished off every last morsel of it. 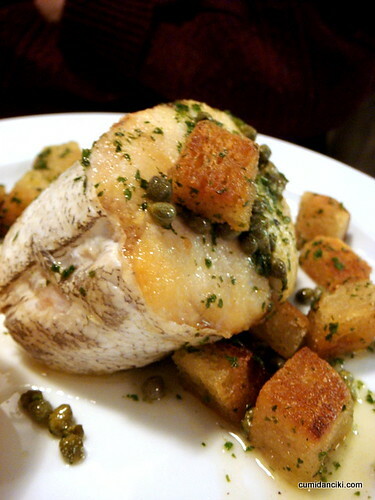 St John has this knack of making even fish, look like an uncouth slab of meat but in a good way. Our meal reaches a bizarre crescendo with this next dish. Finally, I actually get to eat that famous "partridge in a pear tree" that the song sings about, and just before Christmas too. 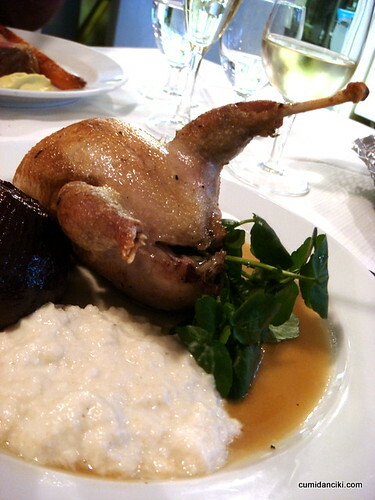 The meat was excellent, the taste superb, the texture like that of a young supple bird that had been roasted on the outside to perfection. 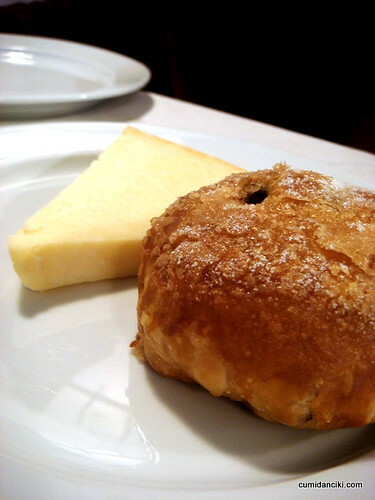 I was told that no other restaurant will serve you such a hearty dessert as the eccles cake. It was huge, solid and went great with the lush, soft and mellow cheese. The Eccles is a puff pastry with currant stuffing.. an English classic to be sure. 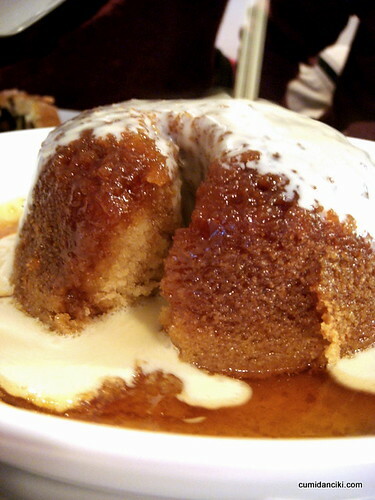 The steamed treacle was cloyingly sweet and rich. Fabulous for increasing energy levels before one ventures out into cold, cold London. 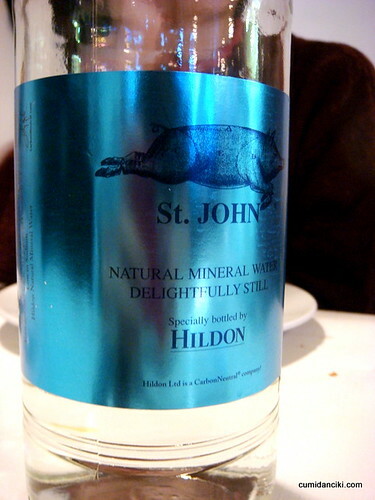 All in all, I enjoyed my St. John experience very much. 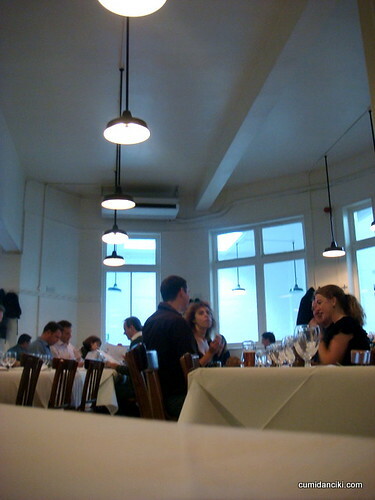 The food is remarkably tasty and I would recommend St John to anyone with an adventurous spirit and who loves good old fashioned hearty English food. One can actually buy the "Nose to Tail Eating - A Kind of British Cooking: St. JOHN Cookbook" as it is on the menu. They also sell St. JOHN Gift Cards if you check with the waiter.